The role of Joe Vegas in William Chrisman High School's production of �Fame� is the largest role Eli Purdom has ever had. And in addition to his acting duties, he has been responsible for the lighting in this production as well. Although it's hectic, the William Chrisman senior said he would not have had it any other way. �Fame� follows a group of students attending the New York High School for the Performing Arts, known today as Fiorello H. Laguardia High School. 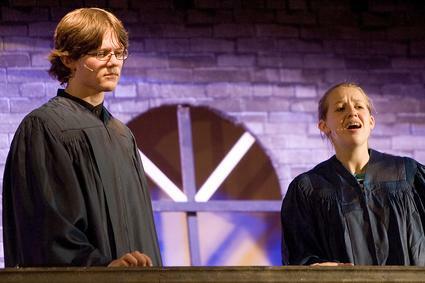 Students at this school get specialized training in acting, singing, dancing and other areas of performance. The stage musical is based loosely on the original 1980 movie in as well as the subsequent remake released in September. �Fame� is at 7 p.m. today, Friday and Saturday at William Chrisman High School, 1223 N. Noland Road. Admission is $4 in advance and $5 at the door. Kimberly Hayes, director of the musical, said she chose �Fame� as this year's musical because it is one of her favorites. She said other than challenges with running so many microphones at once and illness, she said the students have done well with putting it together and are ready for opening night. Senior Hannah Wilson plays Grace �Lambchops� Lamb, a rowdy and outgoing drummer attending the performing arts school. Wilson said what has been the most challenging is playing a character so different from herself. But with some research, practice and watching her classmates, she said she thinks she has improved playing the loud tomboy. Senior Tony Pulford plays Tyrone Jackson, a hip hop dancer who is a little �rough-around-the-edges.� Pulford said this is the first serious character he has played, which he said he finds exciting. He said he watched the original 1980 movie to gain some perspective on Tyrone and has taken a lot of his character development from him. 7 p.m. today, Friday and Saturday at William Chrisman High School, 1223 N. Noland Road. Admission: $4 in advance and $5 at the door.